There’s an interesting trio for the subject of this blog post but you’ll see the post is about the concept of “three.” The main character of The Quarry’s Child, Meg Riley, is an interesting individual. Though much of her life was spent in service to her country as a member of the Coast Guard, Meg is also a bit of an intellectual who learned from an early age to keep an open mind. She understands one is never too “old” to learn something new. In addition, she is a woman of the outdoors and in tune with Nature. A puzzling aspect of the novel arises when Meg notices a particular Celtic symbol that crops up at various times. 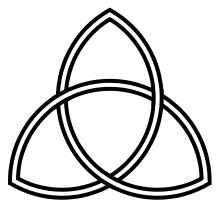 In its simplest form the triquetra is a design incorporating a three-cornered shape. Triquetra means ‘triangle’ in Latin. The symbol is seen on early runestones used by Germanic pagans, it’s seen in the Book Of Kells, it’s a Christian symbol of the Holy Trinity, and it’s used in the modern day on Claddagh jewelry and is known as the trinity knot. Meg is a woman who respects the spiritualism and ideas of many schools of thought and has a particular interest in Native American spiritualism. So it’s no wonder her curiosity is piqued by the monks who lived on the lake and disappeared in the late 1940s. As the mystery surrounding them deepens, more and more triquetra-based symbols appear. The symbol Meg finds most fascinating is that of the Carolingian Cross, made up of triquetras. You’ll have to read the eventual story to see how it becomes an important part of the mystery and how Meg, Clare and Hugh struggle together to solve the mystery. Meg also enjoys poetry. It appeals to her sense of wonderment about life in general and all that surrounds her. It’s no accident that she likes some of William Butler Yeats’ poetry. He was a life-long student of mysticism and spiritualism and it’s apparent in much of his poetry. One of Meg’s favorite poems is “Easter 1916,” a poem at once about the political strife in Ireland but about so much more on a deeper level. Is it worth the price to pay to believe fervently in the independence of a people? So much so that one is executed for treason? These are some of the ideas bandied about in the poem. But lines from the poem will allow Meg to push through to solve the mystery in The Quarry’s Child, as she applies thoughts from the poem to the lives of those she’s trying vindicate and understand. This entry was posted in Carolingian Cross, Celtic symbols, mystery, poetry, strong women, triquetra, Uncategorized, W.B. Yeats. Bookmark the permalink. 2 Responses to Celtic symbols, W.B. Yeats and my main character…. You keep intriguing me with your blog posts, Beth. You may make a mystery reader of me yet, which seems a strange thing to say by someone who grew up with “Nancy Drew.” Ed and I had a chance to visit Yeats’ grave when we went to Ireland. I do enjoy his poetry. Thanks, Mary Jane. Sometimes I surprise myself but I guess it’s no good keeping all of this stuff locked up inside. You don’t have to become a mystery reader. I’ll still like you!